Ramen. So it might be kinda-sorta-Chinese technically, but it’s the noodle that has made it furthest out of Japan (well, at least mostly in dehydrated instant form), surpassing udon and soba. It’s unashamedly fatty and indulgent, flying in the face of the delicate tiptoeing that you see around the likes of somen – and if ramen was a person it would be the messy but irresistible musician type. It’s bad for you but feels so bloody good. However, being Japanese, it’s also an art form. I once watched a documentary on a plane in which three Tokyo ramen chefs (including – SHOCK – a woman!) visit ramen shops within a small area of a nondescript prefecture, taste ramen and give constructive feedback. In the next episode: three Tokyo ramen chefs visit the next small area of a nondescript prefecture, taste ramen and give constructive feedback. Ramen-ya are staffed by obsessives, whose broth and noodle combinations are the source of much handwringing and heartache in the quest for perfection. And there’s as much obsession on the other side of the counter – everyone knows their favourite broth, whether shoyu, shio, miso or tonkotsu. I believe you can more or less judge someone by their soup choice, which means I am of course an excellent people person. 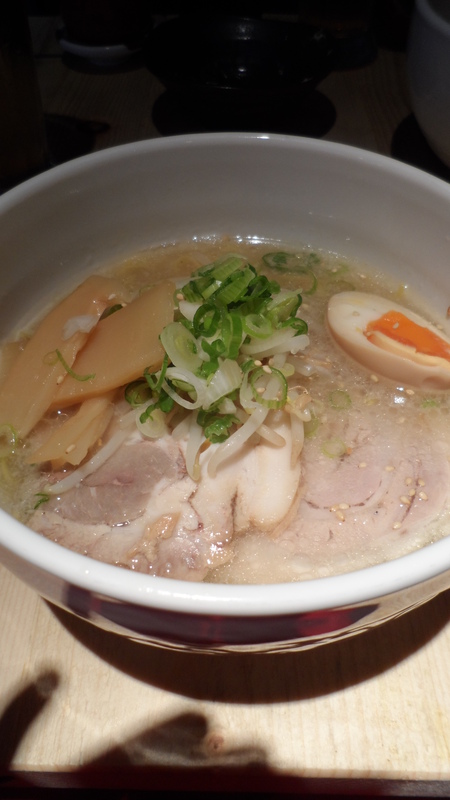 And my favorite is, of course, tonkotsu. So I’ve been eagerly awaiting the opening of Tonkotsu for a long, long time – pretty much since I moved back from Japan four years ago and before Tonkotsu was a twinkle in Tsuru’s eye. Until this appeared, the search for pig-intensive broth around London had been pretty fruitless (stop me if I’m wrong). Surprised at not having to experience a Koya-like queue, getting a table at Tonkotsu was pretty easy for 7pm on a Wednesday night. Service was swift (non-Japanese, not that it matters) and polite the whole way through, although I forgot myself for a moment and just blurted ‘KAEDAMA’ when I wanted extra noodles. Old habits. Anyway, let’s take a closer look at the good stuff. At £11, it’s the most expensive bowl of ramen I’ve ever had, but then I’ve also paid about £5 for a coveted pack of de Cecco when living in Osaka. In summary: it was good and I think it will get better. All the rounds of testing that the Tonkotsu guys have gone through weren’t for nothing – the broth was cloudy as it should be and the distinct tonkotsu taste was definitely there, all served at the perfect non-scalding temperature. What it lacked was a little bit more of the fat being emulsified so that the soup is even richer – less of the oils on top and more throughout the soup (it actually got better as you hit the bottom of the bowl). What it could also have used was an upscaling of the pork content as there’s some notes of chicken there that usually give way to pig flavour. The noodles were the winner – although eggier than your usual light-coloured hosomen that you normally find with tonkotsu, they had the perfect amount of bite and our second portion (yes, second portion) was even better than the first. Toppings-wise, the fat of the chashu was delicious but we could have used a little more soy sauce flavour to bring out the taste. In terms of the sides, we enjoyed the very light pork gyoza (although in need of a vinegary tare) and the tofu in the hiyayakko (cold tofu with bonito) was light and creamy – surprisingly high quality. All we could have used were a few more optional toppings on our table – I’ve been spoiled by Hakata-based chain Ippudo (one more reason to move to New York), where the array of pastes and toppings is dazzling. Perhaps a little pickled ginger or yuzu paste would have allowed us to customise to our heart’s content. 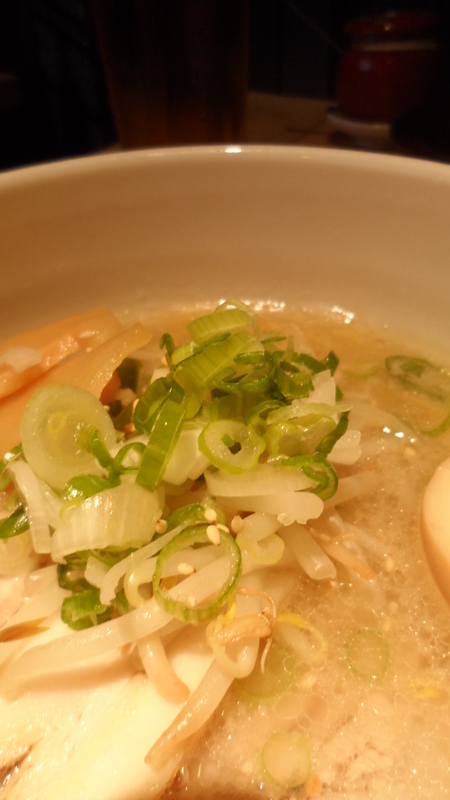 In all, very pleased to have Tonkotsu in town over such a long build-up. I’ll definitely go back and I hope that the broth-making continues to develop so that it comes to match the noodles – and with ramen obsessives, it’s never over.